I took the Update 10 Release Notes, ripped out all the parts that didn’t seem interesting, and reorganized it into a more coherent set of information. I interspersed a few comments of my own as I went (in blue). I will dig deeper into some of the stat number changes in a follow-up article. BTW... sorry that the text looks wonky, Blogger is refusing to accept the fonts the way I am setting them and I am having to recode it. (1) Barter Wallet Info, (2) Stat Changes, (3) Armor Sets, (4) Runekeeper Changes, (5) New places, (6) The Ettenmoors, (7) Mounted Combat, (8) Crafting, (9) Other details. If you want to read the entire 16 page release notes (where you can get specific details on non-RKs for instance), Merric gives the official link and a very handy PDF at CSTM: update-10-release-notes. For every Skirmish Seal in your inventory, there will be a one time conversion, 20 Medallions = 1 Seal. Medallions of the North-men no longer exist. Any existing ones will be automatically converted, 10 Medallions = 1 North-men. Unhatched Spider Eggs and Orthanc Sigil Fragments may now exchange for Medallions, in place of Seals. 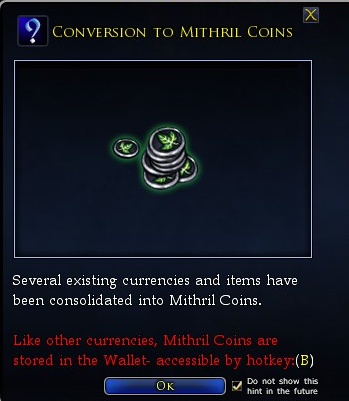 Mithril Coins now available, in barter wallet. ~ Previous Festival tickets and Revival Tomes were converted to mithril coins; 15 coins per revival tome and 5 coins per festival ticket. Those are the only ones I had but the traveler’s writs and a few other widgets were consolidated here as well. Overall, it went from lots of little barters to one consolidated one, which improves your buying power, and that is a good thing. Level 85 1st Age Symbols are available on the Skirmish Barter vendors for Seals. They require completion of the new Erebor raids, with different costs based on the Tier of difficulty completed. 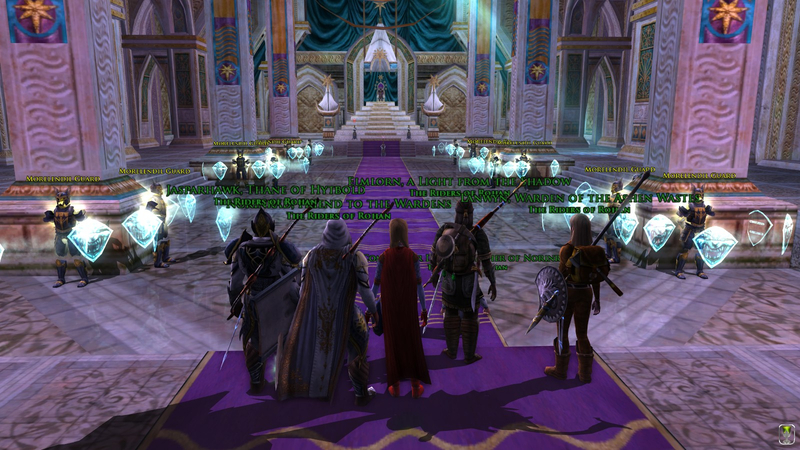 New gems have been added which may drop from the Erebor raids. These are fully tradeable, and used to upgrade the Rohan rings, new raid sets, and used in special crafting recipes. Bofur and that other dwarf (Dori mebbe? All dwarves look the same to me…) give some final advice or parting words before we near the engine known as The Fires of Smaug. Fate/Power Revamp: Fate has more noticeable effects on ICPR and OCPR. Will no longer contributes to players' power pools or OCPR. Players will receive an increased amount of Power at each level, and all skill costs will now be based on a percentage of this power. Each class has also undergone adjustments to their overall power consumption/restoration rates in an attempt to normalize combat longevity. Power Pools have been adjusted. Will users will receive 65 power per level. All skills have had their power costs adjusted to account for changes to Fate/ICPR. Several power restore skills/traits have also had their magnitudes adjusted for the time being as we continue to normalize Fate’s new contributions. ~ I tried to push dps output with reckless abandon just to see if I could consume power by forcing out enough skills. I never saw power pool drop below about 80%, and I definitely have not stacked Fate at all. ~ Previously, Critical was 1.75 points for both Agility and Fate. This new change gives a stronger incentive to push Fate. Critical cap is 25% = 13401; and there is mentioned that there is incentive (though diminished) to push past the cap. Critical Rating now increases both chance to critically hit and the magnitudes of both your critical and devastating critical hits. Will/Tactical Mitigation: Will now provides 2 points of Tactical Mitigation to compensate for the loss of power contribution. ~ Previously Tactical mitigation = Vit * 4 + Armor/5 + direct modifiers. Now, Will-based characters have a lot of tactical mitigation. The Mitigation cap is 40% = 10602. As a relatively high-end RK, the change zipped me right past that mark and I will need to rethink my virtue set to bring Tact mitigation down toward the cap. Critical Defense: Players will see a reduction in their current Critical Defence values as we intend for itemization to play a stronger role in this system. Legendary Item DPS: The damage per second of level 85 weapons has increased, especially for 2nd Age LIs. ~ No, no it didn’t. My LI was 158.0 DPS before, and 158.0 after. If there is a change, it is not observable by the digits shown. Daweirdo, Blinkinn, Kronuz, Meriband, Ulderen, and Supergirl say hello to the first boss in Bells of Dale. Armor sets which give players skill modifying set bonuses have been altered. They will no longer give players stat boosts in addition to skill modifying bonuses. In addition, skill modifying bonuses have been standardized to be on the 2-set and 4-set bonuses. This allows for greater freedom in variety for what the player can wear, and allows for equipment to be upgraded without worrying about losing additional stats from set bonuses, which were becoming increasingly more powerful with each set. ~ Yep, the stats dropped off the armor sets. I am going to investigate exactly where the numbers changed, but what I see is that this change dropped my Will by 107, and subsequently dropped my Tactical Mastery by 1070 (3% less mastery). The Hytbold and level 85 Ettenmoors sets have seen their stats change to reflect the Fate alterations. ~ No, no it didn’t. Neither the Hytbold set nor the Ettenmoors set changed before versus after U10. To verify, I also looked at the barter NPCs and they have what I have. ~ Yes, there are new armor sets. They require completion of the new Raids in T1, and the advanced armors require completion on T2. Additionally, they cost marks, medallions, seals, and new special Erebor gems. I will go into the armors in another post. The Bells of Dale looks lovely when all is empty and things aren’t attacking. ~ These are two power changes to RK. It is mostly irrelevant since power was little concern before U10 and is of no concern after U10. Improved Rune-sign of Flame: Miss Chance buff has been replaced with a buff that allows skills to Bypass 5% of their target's Resistances. ~ The Improved Rune-sign of xxxx is a healing skill that is modified by whichever Element you are in. Each Element has a different buff. The Flame’s Buff changed slightly… whoopy. Scribe A New Ending: This skill now dispels 1 Poison, Disease, Wound, or Fear every two seconds, for six seconds from a target. ~ Scribe a New Ending was the RK skill to remove dread. Since there is no more death dread, this skill changed. It is single target but has some potential to be useful. As it attunes toward Healing, it will take some getting used to but is a now potent skill when you are bombarded with effects. Group visits the Battle of Erebor. 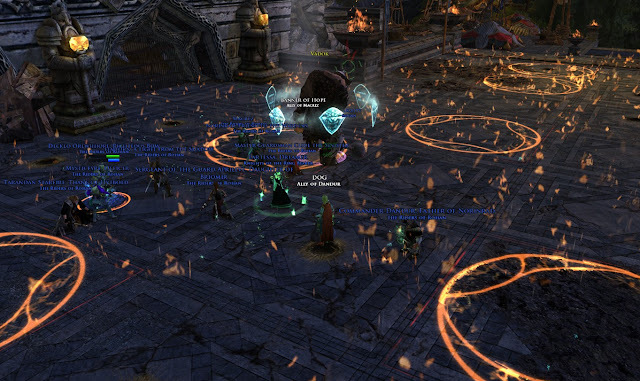 All of the instances in the “In their Absence” instance cluster can now be scaled from level 65 to 85. 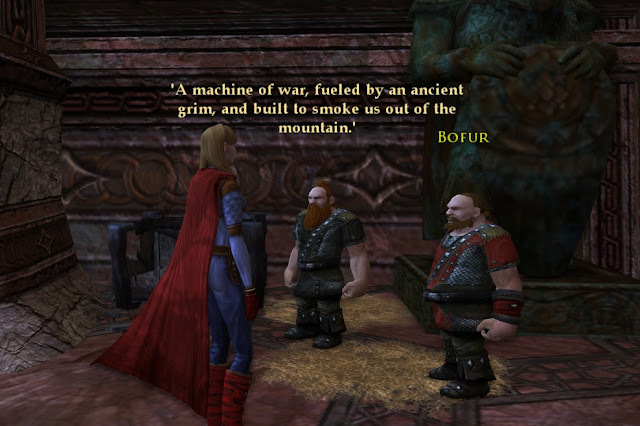 Two trolls are well separated, divide and conquer, during Battle for Erebor. Freep Battlefield Promotions: Freeps now gain a Battlefield Promotion effect for each PvMP Rank they earn. Battlefield Promotions grant bonus Health, Power and Damage for each Glory Rank the player has. 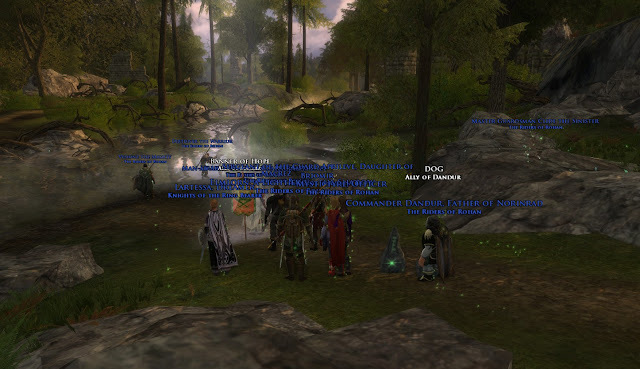 Battlefield Promotions are only active while in the Ettenmoors. Creeps have also undergone significant changes … clip… are able to actively participate in combat for longer periods of time. Although many restoration effects and buffs have been reduced, innate power expenditure should be at a much more manageable point. Creep armor base critical defense reduced, but critical protection corruptions increased. Lainedhal's Insignia and Ak’lhun's Brand (ranks 1 through 14) are now usable in combat, provide a break out of negative combat states and no longer grant any immunity. Their cooldowns have also been reduced. ~ I rarely went to the Moors after Rohan released. Many believe that the changes made to Creeps to match scaleup to Freep 85 made high end creeps nearly invincible; however, some people saw the system as balanced before this change, so as usual, people were mixed. From my perspective, the week before U10, I went out in full Raid where I was possibly the weakest link (most of the other Freeps were R10 and above, and I am only R8) and the Creep Raid wiped us out at will repeatedly with rarely a defeat on the other side. These changes, I believe, are any attempt to rebalance classes. With all the new Free people goodies, will the tide turn back and unbalance the other direction? 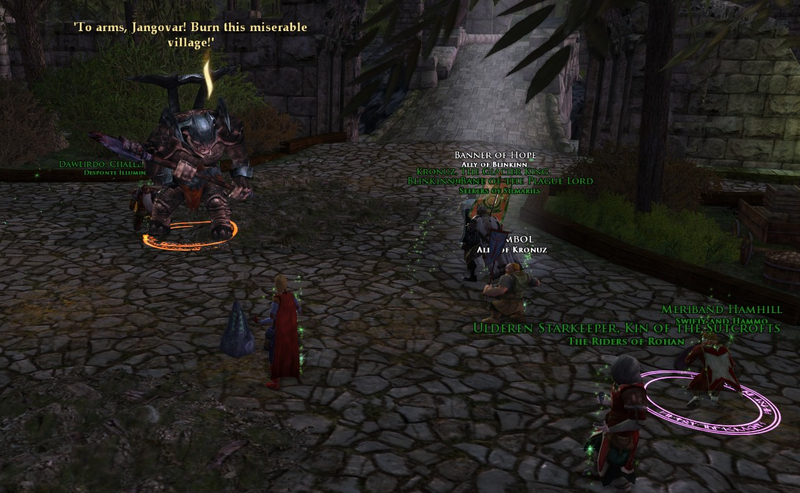 Group prepares for the incoming attack in Flight to the Lonely Mountain. Mounted Combat: The War-steed's Power Trait will now reduce the cost of using Spur On. If Power is fully ranked up, there will be no additional power cost of using your skills. The Power trait will also decrease the power usage per second cost of using Spur On. ~ These changes reflect the power changes for classes. Here is a shot of two news weapons Danadalyn built over the weekend. The Tarnished Crests of Rohan can now be found on the Crafting Skirmish Barter Vendors. Crafting XP values are being adjusted down. Cooks will now be able to use ovens, as well as campfires, to make trail foods. Recipes for First Age weapons and class items can now be found on the Legendary Craft Guild NPCs. ~ It says, “Crafting XP values are being adjusted down”… No, no it didn’t change at all thankfully. Yay to the use of ovens for trail food. 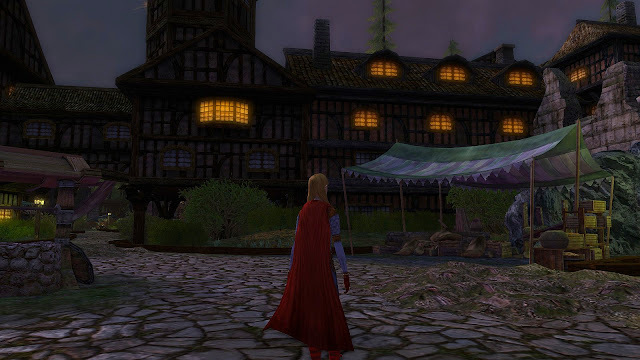 1st Age recipes cost 900s each; Danadalyn, Weaponsmith to the Stars, was in sticker shock. 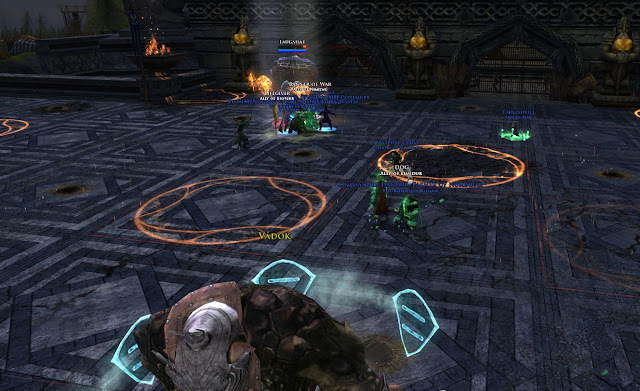 Team lildanas will still be crafting their way to Mordor. UPDATE: After further review of all data I have, I stand by my statement. Character XP for crafting did not change post-U10 versus pre-U10. If anything changed, it wasn't that. So "Crafting your way to Mordor" wasn't affected. (crafting-toward-mordor). Ok, this week, I went to exploring in many different places with friends. 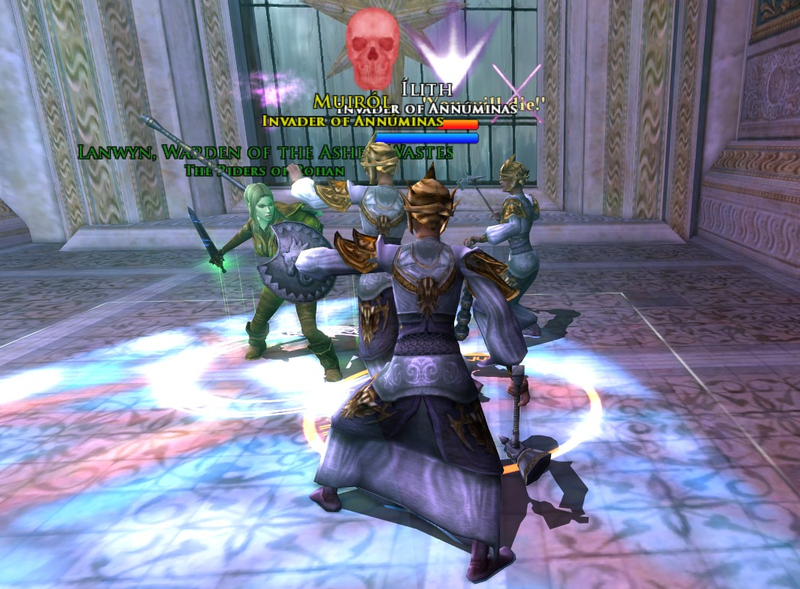 Here is nice shot of Lanwyn tanking the 3 mini-boss sisters in Ost Elendil. Dread on Defeat effects removed. Any quest can now be advanced in a raid. War-steed: The simple tail should now accept dyes correctly. Conjunctions have had their power restore magnitudes increased slightly. The ""Find Items"" feature now darkens the non-matching items and bag icons instead of using the ""New Item"" swirlies. There are two new chat text filters: Loot ( Self ) and Loot ( Fellow ). Loot notification messages for you and your fellows will go to these filters and you can change their font/size in the Options/Chat panel. “Forced” Emotes: "Enable Involuntary Emotes" has been added to your social options panel. Henceforth, you may uncheck "Enable Involuntary Emotes" to opt out of involuntary emotes (emotes which another player is attempting to force you to execute). Standardized the names of Tier 1 through Tier 9 relics. Slightly lowered the amount of xp on the heritage runes received when refining relics. The amount of xp will increase as the level/tier of the relic being refined increases. Jasparhawk, Norinrad, Elmlorn, Lanwyn, Dandur, and Supergirl make sure Annuminas is still in control after U10. Thanks Anonymous. I totally agree with you that that was what the dev message intended. My intent was to collect data to present on how much it changed, but in fact, there was no change at all in character XP you receive while crafting. If you were farming and cooking your way to level 30 (or 50, or 85) before, the experience post-U10 is identical to what it was. So says my nine crafters who are still doing it. Very exciting stuff!!! I absolutely LOVE the Power changes! My Captain never runs out of power anymore! And the Annuminas shot is beautiful! I had to include the Annuminas because it was just so darn pretty.